This RIDGID 50 ft. 10/3 All Weather Extension Cord is a contractor grade cord ideal for powering heavy duty equipment and tools. Cable jacket is made of elastomer material that allows it to be resistant in oil. It also features an extra flexible and durable cord that performs well in any types of weather conditions. It also comes with a built in power light signals when the cord is in use. 50 ft. grounded 3-wire extension cord may be used with power tools and appliances for heavy duty applications inside and outside of your homes. The Husky Green Indoor Extension Cord suit for extending your appliances and power tools. This 50-ft long cord let you supply the power to any narrow space.The outer jacket is green for high visibility in case you may accidentally kick this cord out. 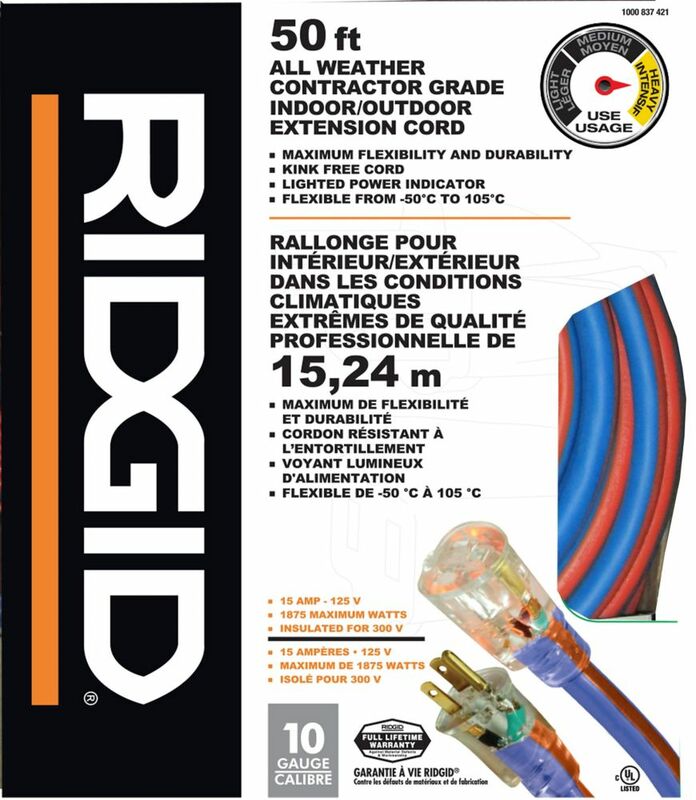 All Weather Extension Cord This RIDGID 50 ft. 10/3 All Weather Extension Cord is a contractor grade cord ideal for powering heavy duty equipment and tools. Cable jacket is made of elastomer material that allows it to be resistant in oil. It also features an extra flexible and durable cord that performs well in any types of weather conditions. It also comes with a built in power light signals when the cord is in use.